Recent research by Mason et al. (2010 and 2011) has highlighted the potential of Diffuse Gradients in Thin-Films (DGT) technology to examine plant available P concentrations in wheat soils. These studies showed that DGT-P tests were more effective at predicting wheat response than currently used tests such as Colwell P or resin P tests. 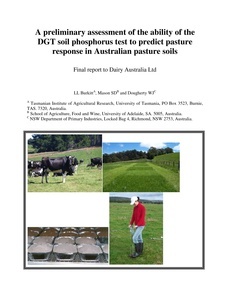 Since intensive pasture industries are large consumers of P fertiliser and limitations to our most common agronomic soils tests (Olsen and Colwell P) have previously been identified in the literature, an examination of the new DGT-P test for pastures was justified. Since pasture calibration studies are very time and labour expensive to conduct, the analysis of soil samples collected from historic pasture P calibration studies was the only viable option in terms of undertaking a preliminary investigation of DGT-P for pasture soils. After careful consideration of the historic pasture calibration studies available, the National Reactive Phosphate Rock (NRPR) study which was conducted between 1992 and 1994 was selected as it included 25 experimental sites which represented a wide range of soil types and climates used for pasture production in Australia. Importantly, the soil samples collected from this study were conveniently stored at LaTrobe University in Melbourne, Australia and the historic soil and pasture yield data were easily accessible. In order to assess the ability of DGT-P to predict pasture P response using the NRPR data set, soils which had been in storage for ~19 years required analysis for DGT-P, Olsen P and P buffering index (PBI) and re-analysis for Colwell P. When the soil test P concentrations measured in 2011 were related to the relative pasture yield, the results showed that in general, Colwell and Olsen extractable P methods more accurately predicted relative pasture P response for the NRPR data set compared to DGT-P. Although the limitations of bicarbonate extractable P tests in terms of their harsh extraction process and difficulties in predicting pasture P response across a wide range of soil types, climatic conditions and pasture species have previously been identified in the literature, based on the current data set, these tests performed better at predicting P responsiveness than the novel DGT-P method. However, given a number of issues identified in the current study (low P fertiliser effectiveness on high PBI soils, possible solubilisation of less labile P forms by pasture root exudates and potential increase in the amount of P sorbed during soil storage), it is recommended that further studies be undertaken using newer pasture species and N fertiliser applications before a firm conclusion can be drawn regarding the performance of the DGT-P test for predicting pasture response to P.